Over a billion people worldwide suffer from poor vision because they do not have the eyeglasses they need. While there are affordable eyeglasses that can be bought for less than $4, there are not enough eye care professionals to prescribe eyeglasses. PlenOptika created QuickSee to increase the throughput of optometrists, allowing them to prescribe more eyeglasses and make more money. QuickSee is an innovative, handheld auto-refractor that provides highly accurate measurements at the push of a button. The increase accuracy comes from the custom hardware and software which have been test designed and iterated with various prototypes. 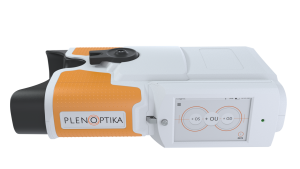 After multiple clinical studies, PlenOptika has created an easy to use device that has been tested by many thoughtful users. 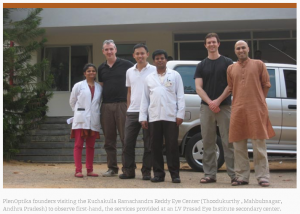 PlenOptika has worked with over 1300 patients and in 5 countries. It has come a long way from the Madrid-MIT M+Vision Consortium back in the spring of 2012. PlenOptika has participated in and been supported by the MIT $100k Entrepreneurship Competition, MassChallenge, MIT-MISTI India Technology Innovation Fund, Harvard Innovation Launch Lab, SPIE Startup Challenge, Hult Prize, Indo-US Science Technology Forum Endowment fund, and National Institutes of Health SBIR program. PlenOptika is preparing to bring QuickSee to market this fall and open a warehouse in October. Thank you to Shivang Dave, Ph.D. and PlenOptika for being SOLIDWORKS Entrepreneurs and sharing with our community.